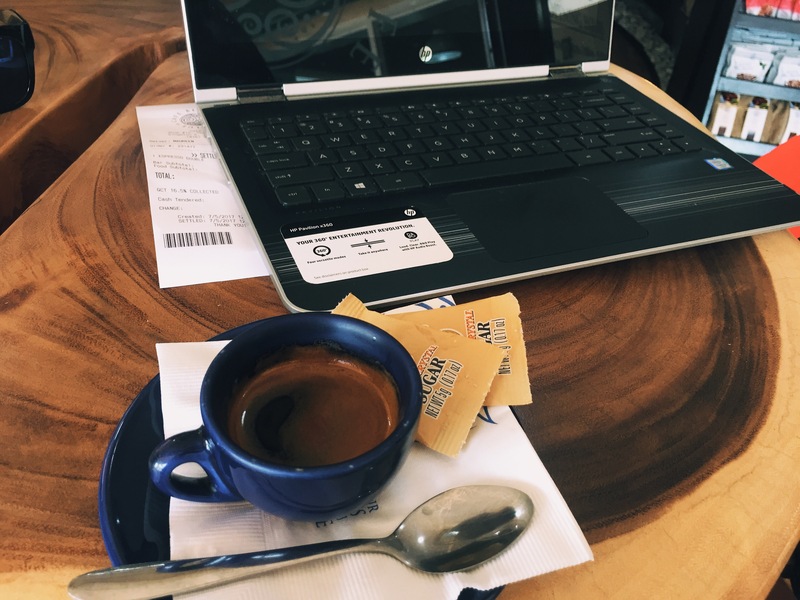 Laptops and Lattes are our soulmates when not working from the office, or rather, remotely. Ask the digital nomads, the freelancers, bloggers and other creators. Even the most office-centric, who prefers to work from within an iron clad cubicle, around a purposeful looking desk will admit, however begrudgingly. After all, who opposes the satisfaction of a flat white or a cold brew, while whipping out their laptop, without the burden of hearing your co-worker obsess over her 10th new boyfriend for the year, or finally publishing that days overdue blog post, or even emailing that Social Media Manager cover letter for the 1000th time. Those days when the library just wont cut it, and roommates and flatmates are increasingly listening to Drake when you’re actually trying to study. Free and reliable WiFi, good coffee, even a greater ambiance, with power outlets and bathrooms, all have the basics covered. Granted we won’t sound too entitled, solid menu options, and the appropriate noise level (about a hotel lobby on a scale from a convent to the stadium), would seal the deal. But as for those of us who go to coffices (coffee shop offices. Get it? No? Sorry) solely for using WiFi under the guise of purchasing bottled water, this will ensure management doesn’t catch on. Reading this from the office? So passé, here are the best cafés in Kingston where you can set up shop for a while and get some work done. Just remember to purchase another item periodically. Get your laptop and let’s go! 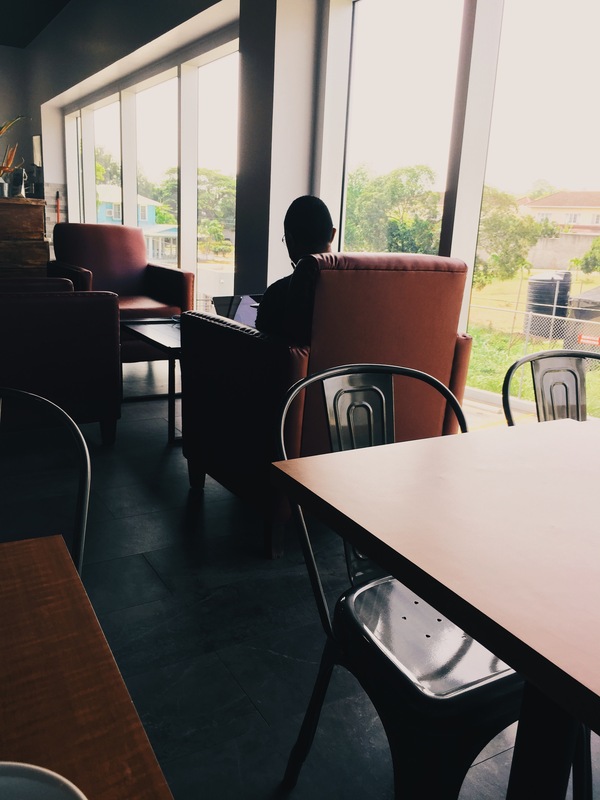 First things first; opt for the table closest to the cashier if you have your eyes set on a power outlet, or if you have a thing for the smell of freshly roasted coffee beans. The beautifully maintained minimalist space is a relaxed safe haven with an accompanying art gallery, for a chance to catch up with work on your own time, or those 10 am coffee breaks. 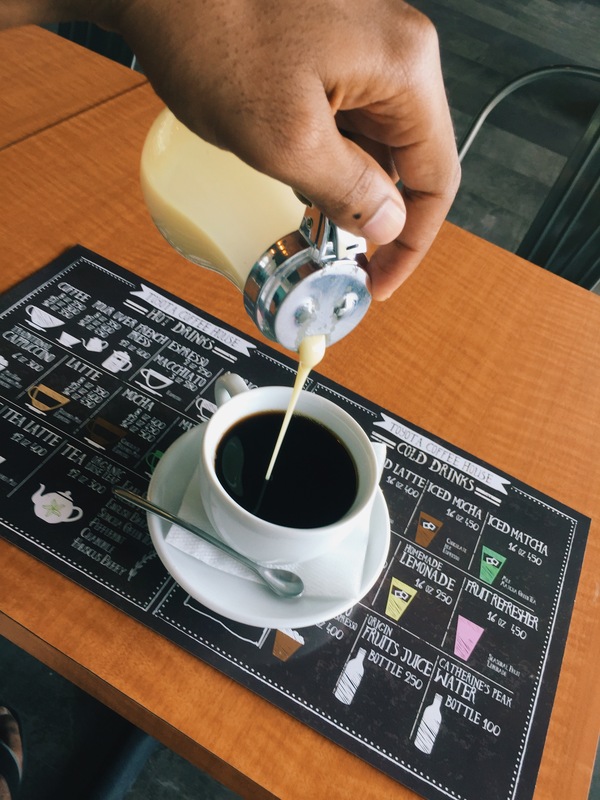 If Bagels, Pancakes, Waffles, and Croissants are your language, this modernized coffee house is the place to set the tone for your day with an Instagram-worthy breakfast. The crowd is usually quiet and concentrated, but it could be your little utopia if you happen to be there on its off hours. As far as bathrooms are concerned, you might want to have a backup plan, because there is none at this location. Recommended: sit at the tables directly by the glass windows, and watch the world go by as you pretend to pen your opus. But more seriously, pull out (your laptop), plug-in, connect to the WiFi and be productive. The newest addition to this category, this semi-public coffice is right within the premises of Toyota Jamaica’s state of the art show room. Offering brews from beans home-grown, hand-picked and roasted at Alex Twyman’s Old Tavern Coffee Estate in the Blue Mountains, this is the perfect backdrop for a lunch break from work. Dear Toyota vehicle-owning friends, this is certainly the place to kill time while getting your car serviced, sipping some homemade lemonade or the signature Fruit Refresher, while looking at the busy Old Hope Road commute. While not necessarily vegan friendly, there’s so much on house (didn’t say it’s free) to satisfy the greediest appetite. The well-maintained bathroom is also worthy of mention if you plan to be there for a while, and before going further, the power outlets have you covered too. With varying seating and table height options, and also couches, the walls lined with prints of vintage Toyota vehicles will help take you back in time, under the suitably radiating modern vintage, pendant hanging light bulbs. Just be sure to pick up a bag of Alex Twyman’s Dark Roast Espresso so you can brew on your own time. The scenic Irish Town lacks in the perfect atmospheric work space but strangely enough Café Blue fits in effortlessly. A work-from-café wonderland, the original of the Café Blue franchise, your brew is free if you get no receipt upon placing your order. Workweek blues pushing you over the edge? This joint is nothing short of a prime spot for the work-stricken to escape to on weekend mornings to reset after a long week, while enjoying smooth coffee under the rustic backdrop and natural lighting. As for the digital work force, the neighboring restaurant offers noms which have the potential to see you through a full day of work. Take advantage of the Cold Brew special, or the signature Bluecinno to pair with your novel-writing. Whatever your persuasion, the barista Nichola takes her coffee seriously. But no more beating around the bush, the WiFi is free if you can guess the Spanish equivalent for an American male. (Don’t think too hard, it’s literally what you’re thinking. Yea, really). Shop 8 Sovereign North, Barbican Rd. (876-970-1532). Rum in your coffee? Or better yet, rum cream in your coffee? This is the coffice for that. It’s the perfect hybrid between a hotel lobby and your living room, and you can always find a seat here. Another one where you hope great ideas enter your mind by osmosis, the signature low lighting as with most cafes, sets the tone for you to alternate between your to-do list and bites of the Cannonball Mystery Cookie. This pleasantly quiet spot with a hint of background music, is where we could all see ourselves bobbing our heads, while attending to all those emails marked as ‘read’ for the past week. 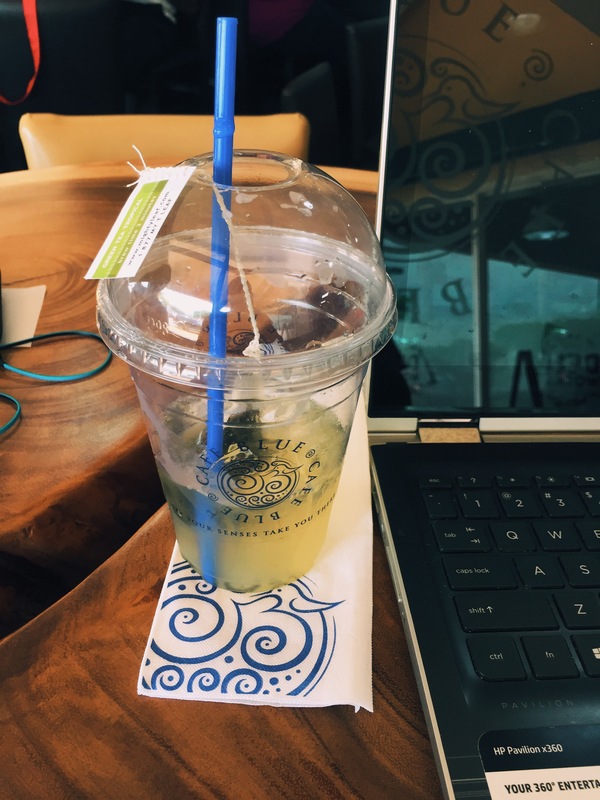 The passable coffee and decent WiFi will have you going off on work like a loose cannon, but opt for the Apple-Cinnamon iced tea, or the Bubble Gum flavored iced lemonade if coffee is not your calling. Their menu may be a bit pricey for the frugal but the bathroom and trendy playlist make up for that. You may also check out their other outlets in Manor Park, New Kingston, and Barbican Centre if you happen to be within those precints. Recommend: Sit at the tables facing the parking lot and low-key judge the customers entering and leaving the nearby bakery. Just don’t get caught. Be seen working and minding your own business. 24 Seven Café regulars make better choices; they probably eat healthier, and they probably don’t read too much into their horoscope. 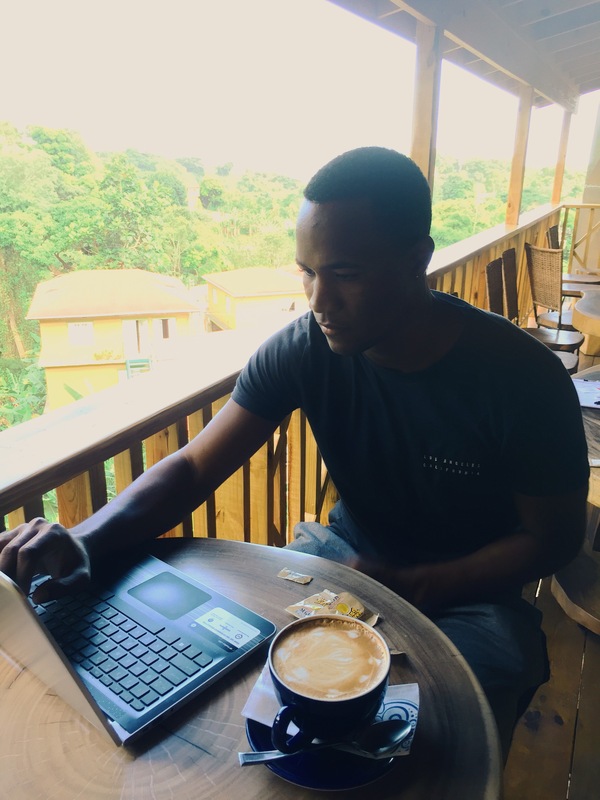 Smack in the middle of Kingston’s preferred hotel, this posh café is where it’s at for sitting with your laptop and enjoying your life as a dual citizen of Jamaica (or wherever you’re from), and Gmail. All pastry and baked noms are fait maison (made in-house), and are also aces. So grab a mug of the London Fog Tea Latte, to go with your Knutsford Boulevard Pork Panini. Seating options are two and four- seater tables, all set with condiments for your coffee, but the real action takes place by the seating area on the non-service terrace overlooking the pool, and tennis court. PS. The mirror and lighting in the consistently clean and touch-free bathroom, makes for the perfect selfies. If by chance I forgot to mention it’s open 24/7, the name conveniently reminds you, and the WiFi is free for two hours with every purchase, so no freeloading. Just remember to get those bathroom selfies, and did I tell you about the Passion Fruit Cheesecake? Caffeine addicts, come this way. This is your ideal spot for a morning grab-and-go or your afternoon sip-and stay. Either way, anywhere that sells coffee syrup is an automatic winner. Don’t give a thought to seating options; the lounge couches to the left of the entrance, are prime for people watching and Instagram lighting, but more importantly, creating. Otherwise, if you’re lucky enough to grab one of the few two-seater tables, just be prepared for the hatred from those who arrive after you. Whichever is your style, the copious charging outlets take care of you, and your devices. Indulge in Rituals’ coffstry (coffee-pastry) magic, with a Cinnabun flavoured coffee, or go wild with the Raspberry flavour, then proceed to look into the fact whatever you see on the price list is how much pay, instead of your blank word document. There’s WiFi too, so don’t procrastinate; create and caffeinate. Early risers may find that Susie’s Bakery and Coffee Bar does not fit into their 7am breakfast routine, as work in this coffice begins at 9am, and was designed with the ’15 more minutes’ snoozers in mind. But as for the always missing breakfast populous however, breakfast is available buffet style ALL DAY, and they go all the way until 12 am, if you happen to be running late and inadvertently have to miss breakfast… again. In a perfect world the menu would be a bit more budget-friendly, but this spot hosts serious, laptop-tapping creatives usually seated to the left of the entrance, overlooking the outdoor terrace. Chances are you will most likely identify Susie the moment you walk in without thinking twice, with that cool- everyone’s favorite aunty vibe which can’t go unnoticed. They told us to follow our instincts, but what they didn’t tell us is that, the Island Mocha Cheesecake is a good combination with your Oreo Cookie Smoothie, and both look picturesquely Instagram-worthy. Also, don’t trust They. Try the 876 Blend if you love yourself at all, and attempt to decipher the secret combination of coffee’s which are used to make this house special. Yes, they have WiFi, you can breathe now. So walk with your mobile office, and some extra cash to pick up a few of Susie’s baked treats.